For the second year in a row, eLeaP has been named to the top 10 most user-friendly Learning Management System software list by Capterra, a Gartner company. — Don Weobong, President, Telania | eLeaP. LOUISVILLE, KY, USA, December 4, 2017 /EINPresswire.com/ -- Telania, LLC. 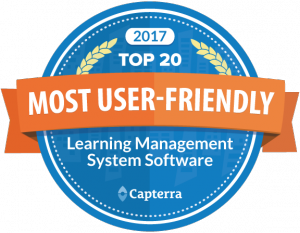 announced today that its eLeaP LMS Platform has been named a Top 10 Most User-Friendly Learning Management software product by Capterra (a Gartner division), a free online service that helps organizations find the right software. Company President Don Weobong, had this to say about this awesome recognition, "For the second year in a row, Louisville-based eLeaP has out-performed some of the biggest names in the industry. We continue to give thanks to our customers, team members and our hometown for their continued support since 2003! We got into this space to help organizations solve tough business challenges using engaging, interactive and trackable learning and training. We still wake up each day to this unique opportunity to be of service to many diverse and awesome clients and for that, we are eternally grateful". The Top 10 Most User-Friendly Learning Management Software is an independent assessment that scores products based on their overall usability, customer service and user reviews published on Capterra's website. The Top 10 User-Friendly Learning Management is available at https://www.eleapsoftware.com/top-10-most-user-friendly-lms/ . As with any technology, the people behind the product are just as important as the actual product. eLeaP is supported by actual humans who treat their clients with respect and use creativity to solve your unique challenges. Speaking of the team behind eLeaP, be sure to check their site for what their customers say about their product. For example, Ariane Butcher, Corporate Trainer, Winterwood, Inc. said, "We are having a lot of positive feedback about our new LMS. It is so exciting to have such great results from our employees. Recently we received a suggestion from a supervisor for Winterwood. She requested access to see her employee activity results for the team of managers she supervises and eLeaP had this feature right there." So what is eLeaP? eLeaP is a cloud learning management system that centralizes online training and development on one comprehensive and easy-to-use platform. eLeaP enables their clients to solve tough business challenges by providing their teams with right training at the right time on any device. eLeaP also plays nice with all your other software products using API, Single Sign-on and custom integration if needed. For more information or to try a free trial visit their website: https://www.eleapsoftware.com/ eLeaP comes replete with a full-service customer support team as well as a world-class library of training videos and support documentation to enable anyone quickly get up to speed creating and delivering content in no time. About Capterra: Capterra is the world's leading free software discovery and reviews platform, where organizations of all types and sizes start their search. Founded in 1999, Capterra was acquired in 2015 by Gartner, Inc. Capterra.com features the largest online collection of software user reviews and research across hundreds of categories. Every year, Capterra helps millions of buyers find the right software solutions for their business.